How often have you heard this excuse for not having church greeters? Greeting church visitors is every one’s responsibility. However, you know this doesn’t always get done. Thus, many churches have organized greeting teams to serve a few weeks in a row. In my experience, some times people who are recruited as church greeters may not be sure exactly what to say or how to give a greeting. Read: 20 Crazy Things Church Greeters say. You’ll need to find ways to improve the greeting ministry of your church. This list above comes from my search logs just in the past 3 days. So let me share some possible starting scripts that you can use yourself, or develop more fully into a resource you can use at your church. If you are a church greeting coordinator, perhaps you might want to consider giving a script to your new greeters. Once people say something a few times, they might feel the liberty to relax and put their own flavor to it. You can give your new greeter permission to mess up. Consider these as guidance to offer them. Welcome to [church name] this morning! We’re glad you are here this morning. I’ve not met you yet! Welcome. During the worship service, the leader can say something like the following to welcome visitors. We are glad that you are here with us this morning. If this is your first or second Sunday with us, we are grateful that you have come to be with us this morning. It is our hope that you experience the love of Christ this morning and His presence during our worship. If your church does the passing of the peace handshake ritual, the worship leader can go on to say this to help the church greet visitors (See #5 in this list of 10 practices to welcome church visitors). Get up, turn and greet someone that you’ve not met yet. Shake their hand, introduce yourself, and take a few moments to welcome them to God’s house. 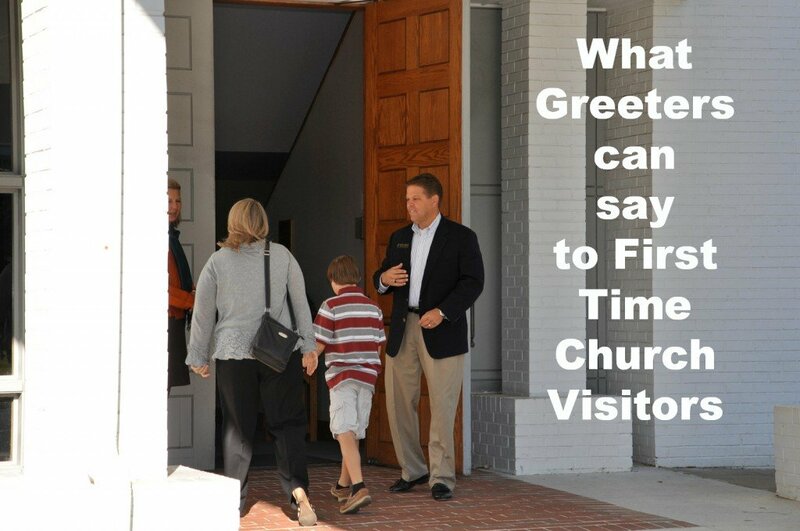 See more tips at How to Say the Welcome Greeting at a church. During the fellowship reception time after the service, church members can be encouraged to look out for and intentionally greet people they haven’t met. With that, I offer my hand to shake and I continue with a conversation. Follow up: 20 Blunders in Welcoming Church Visitors. What things do you say to greet visitors to your church? Add your thoughts below. A note to the reader: Did this answer your question? If not, use the comment field below to ask me more specifically what you look for so I can create a future article. Do you lead your greeter ministry? I heard a good one yesterday. The church had placed a visitor card in the bulletin and here is a part of how people were welcomed. The rest of the “welcome speech” was good and well done, using many of the elements above. It was given by the pastor who was leading the liturgy. Hi, I am Janet. Was called by the prompting of the Lord and timingly called by our church Pastor’s wife to relive it. We have had a Hospitality Ministry some time back but is inactive. Would like to revive it for the expansion of His kingdom. Am launching it beginning June. Am now trying to create a card to too. Pls advise. Appreciate your reply. This prevents the embarassing, “I’ve been coming here for about three years now.” It also lets the rover or greeter know that this person needs to be escorted to the welcome center. Great site. I like what you’ve got going on here. Thanks Bud. That’s a great point for greeters. Does it create any awkwardness if the answer is “none, this is my first visit?” I think you’ve got a great question. In settings where thousands of people are streaming into and out of a lobby between services folks aren’t surprised by the question. I am not aware of any awkward encounters but I’m sure there must have been a few. Would you be interested in writing a guest post for us? We have a series on church visitors going on and it would give you an opportunity to hit additional readers and a link back may draw some folks to your websites. Thanks, we all enjoy the welcome note. to stand with me to expand the word of God to others. Let visitors know that you are their brothers and sisters in Christ because we are all God’s children. All God’s children are welcome to God’s house. Thank you for coming this way but God has a lot of church doors that are open you could have went to, but we are glad you chose this church to join today. We are glad and happy to see you and anytime God’s doors are open, some one will greet you with a smile or a hug to let you know we are all welcome to God’s house. Congratulate them on taking the next step to becoming members and volunteers. Help them find places to serve. Celebrate that decision. THere is no special formula, but honor them with your words, appreciation, and actions.